Seit Anfang 2015 ist die Anwendung gütegesicherter Biogutkomposte nicht nur in EU-Ökobetrieben, sondern auch in Betrieben der Ökologischen Anbauverbände Bioland und Naturland, seit Frühjahr 2016 auch beim Anbauverband Biokreis möglich. Bereits zuvor waren bei allen genannten Betrieben Grüngutkomposte einsetzbar. 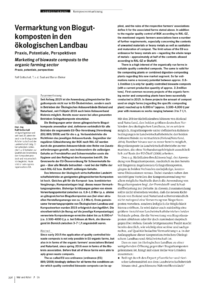 Die Bedingungen unter denen gütegesicherte Biogutkomposte anwendbar sind, definieren verbindlich für alle Betriebe die sogenannte EU-Öko-Verordnung (Verordnung (EG) 889/2008) und für die o. g. Verbandsbetriebe die Richtlinien des jeweiligen Anbauverbands. Gegenüber der regulären Gütesicherung der BGK nach RAL-GZ werden durch die genannten Anbauverbände eine Reihe von Zusatzanforderungen gestellt, was insbesondere die zulässigen Gehalte an Fremdstoffen und Schwermetallen sowie die Hygiene und den Reifegrad des Kompostes betrifft. Die Grenzwerte der EU-Ökoverordnung für Schwermetalle liegen  über alle Metalle betrachtet  rund bei der Hälfte der nach RAL-GZ bzw. BioAbfV zulässigen Gehalte. Das Interesse der ökologisch wirtschaftenden Landwirtschaftsbetriebe an geeigneten gütegesicherten Komposten ist hoch. Gleiches gilt für die Kompost- bzw. kombinierten Vergärungs-/Kompostanlagen bzgl. dieses neuen Vermarktungssegmentes. Bisherige Schätzungen gehen von einem Verwertungspotential zwischen ca. 0,81,0 Mio t p. a. alleine an gütegesicherten Biogutkomposten aus (bei einer aktuellen Herstellungsmenge von ca. 2,3 Mio t). Erste gemeinsame Verwertungsprojekte von Ökologischem Landbau und Kompostwerken wurden 2015 erfolgreich durchgeführt. Die einzelbetrieblich (in Bezug auf die jeweilige Kompostanlage) verwertete Kompostmenge erreichte dabei bis zu 6.000 m³ (ca. 3.5004000 t) p. a. bei Erlösen ab Werk, die überwiegend im Bereich zwischen 37 R/t angesiedelt waren. Since early 2015 the application of quality controlled biowaste composts is not only possible in EU organic farms, but also in in farms of the organic farmers associations Bioland and Naturland, since spring 2016 even in farms of the Biokreis association. Before that all of these farms were able to aply green waste composts. The so called EU eco ordinance (ordinance (EG) 889/2008) bindingly defines for all farms the conditions under which quality controlled biowaste composts can be applied, and the rules of the respective farmers associations define it for the associated farms stated above. In addition to the regular quality control of BGK according to RAL-GZ, the mentioned organic farmers associations have a number of further requirements, especially concerning the contents of unwanted materials or heavy metals as well as sanitation and maturation of compost. The limit values of the EU eco ordinance for heavy metals are  regarding the whole range of metals  approximately at half of the contents allowed according to RAL-GZ or BioAbfV. There is a high interest of the organically run farms in suitable quality controlled composts. The same is valid for the composting plants or combined digestion-composting plants regarding this new market segment. So far estimations name a recovery potential between approx. 0.8 1.0 million t/a only for quality controlled biowaste composts (with a current production quantity of approx. 2.3 million tons). First common recovery projects of the organic farming sector and composting plants have been sucessfully conducted in 2015. In these projects the amount of compost used on single farms (regarding the specific composting plant) reached up to 6,000 m 3 (approx. 3,5004,000 t) per year with revenues ex works ranging between 3 to 7 R/t.